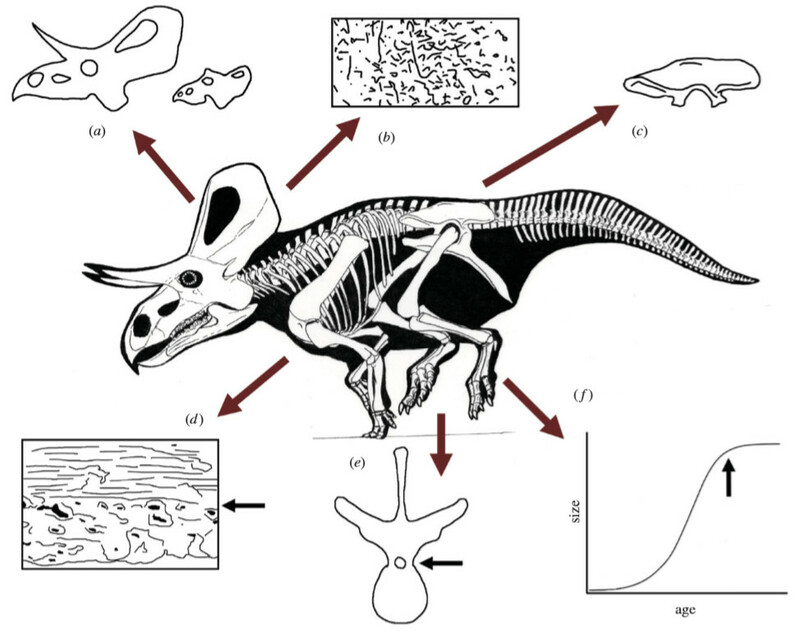 Various methods that may be used to determine the age/ontogenetic status of a given dinosaur specimen. Central image is a reconstruction of the skeleton of an adult ceratopsian Zuniceratops, with surrounding indications of maturity (taken from multiple sources and do not necessarily relate to this taxon). (a) Development of sociosexual signals (adult left, juvenile right—modified from ), (b) surface bone texture (traced from ), (c) large size, represented here by an ilium of the same taxon that is considerably larger than that of a known adult specimen, (d) reproductive maturity, here based on the presence of medullary bone here shown below the black arrow (traced from ), (e) fusion of the neurocentral arch—location of the obliterated synchondrosis indicated by black arrow (traced from ), (f) asymptote of growth based on multiple species indicated by black arrow (based on ). Central image by Julius Csotonyi, used with permission. Hone et al. (2016: fig. 2). The idea that dinosaurs had unusual life histories is not new. The short, short version is that it is usually pretty straightforward to tell which mammals and birds are adults, because the major developmental milestones that mark adulthood – reproductive maturity, cessation of growth, macro-level skeletal fusions, histological markers of maturity – typically occur fairly close together in time. This is radically untrue for most dinosaurs, which started reproducing early, often well before they were fully grown, and for which the other signals of adulthood can be wildly inconsistent. 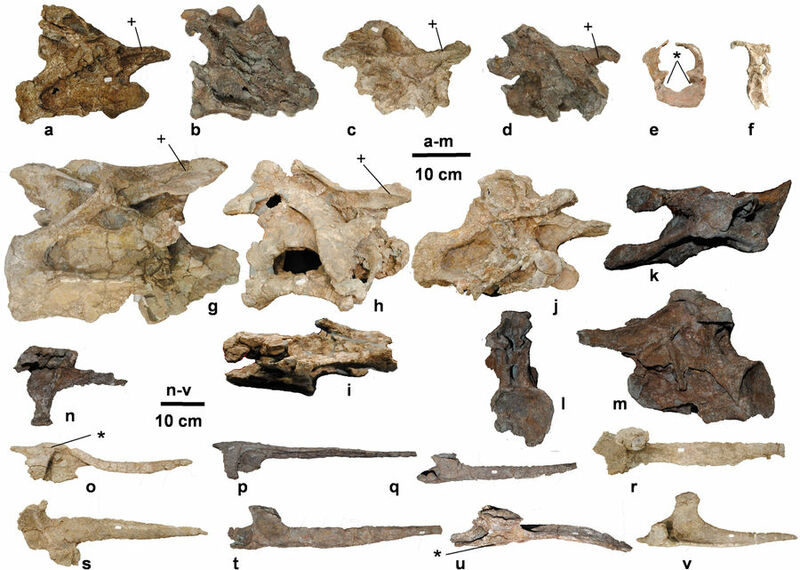 We don’t talk about this much in the paper, but one aspect of dinosaur life history should be of particular interest to sauropodophiles: most of the mounted sauropod skeletons in the world’s great museums belong to animals that are demonstrably not mature. They’re not the biggest individuals – witness the XV2 specimen of Giraffatitan, the giant Oklahoma Apatosaurus, and Diplodocus hallorum (formerly “Seismosaurus”). 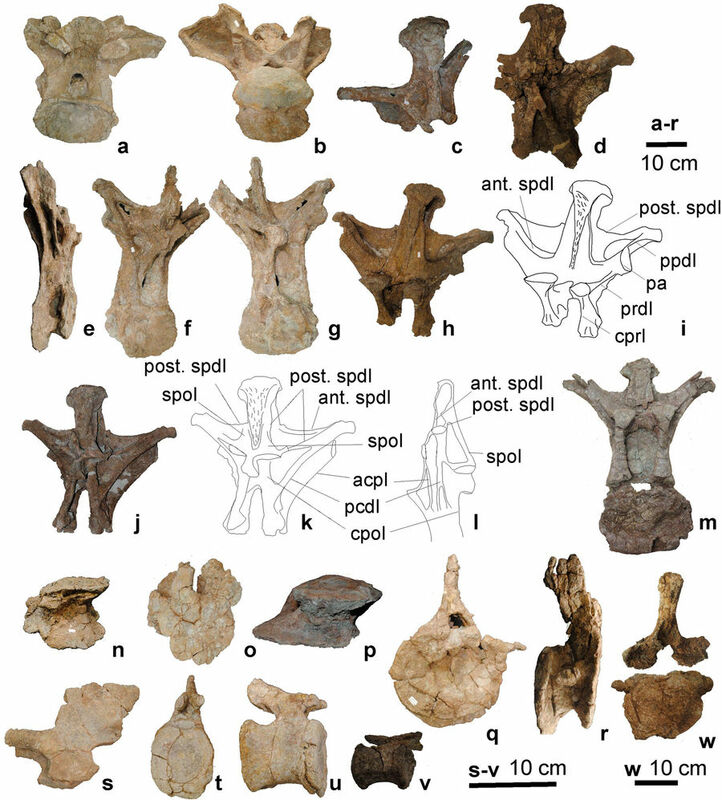 * They’re not skeletally mature – see the unfused scapulocoracoids of FMNH P25107, the holotype of Brachiosaurus mounted in Chicago, and MB.R.2181, the lectotype of Giraffatitan mounted in Berlin. And histological sampling suggests that most recovered sauropods were still growing (Klein and Sander 2008). 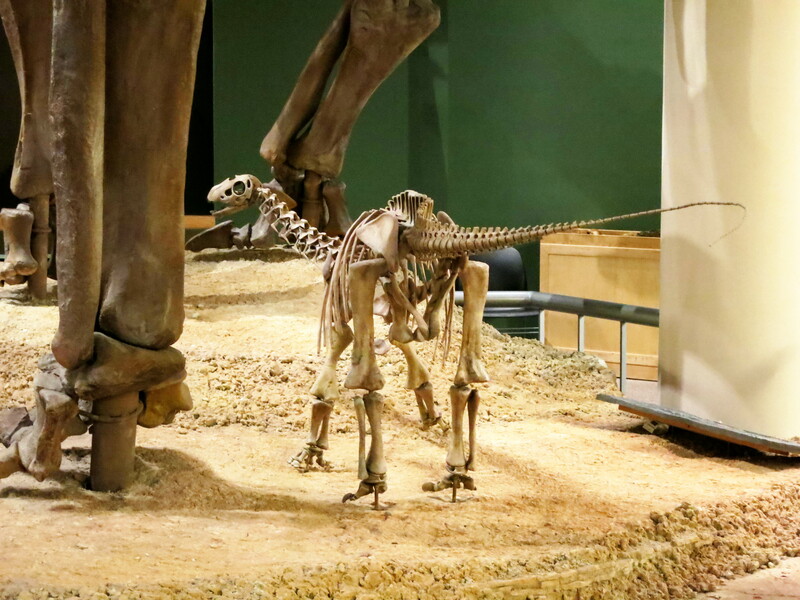 * The Oklahoma Museum of Natural History does have a mounted (reconstructed) skeleton of the giant Apatosaurus, and the New Mexico Museum of Natural History has a mounted reconstructed skeleton of Diplodocus hallorum. But as nice as those museums are, in historical terms those mounts are brand new, and they have not shaped the public – and professional – conception of Apatosaurus and Diplodocus to anywhere near the same degree as the much smaller specimens mounted at Yale, AMNH, the Field Museum, and so on. Basically, very little of what we think we know about sauropods is based on animals that were fully grown – and the same problem extends to many other groups of dinosaurs. This is kind of a methodological nightmare – a colleague on Facebook commented that he had pulled his hair out over this problem – and in the paper we suggest some ways to hopefully alleviate it. I mean, the biology is what it is, but we can minimize confusion by being really explicit about which criteria we’re using when we assign a specimen to a bin like “juvenile”, “subadult”, and so on. Personally, I’m more excited about the possibilities that dinosaur life history weirdness open up for dinosaur population dynamics and ecology. Confession time: I am a recovering and relatively high-functioning evolutionary theory junkie. In grad school I was on the heavy stuff – I read tons of Gould and Dawkins and admired them both without being smitten by either. I took seminars on Darwin and evolutionary morphology, and lots of courses in ecology – ever mindful of Leigh Van Valen’s definition of evolution as “the control of development by ecology”. I read a fair amount of Van Valen, too, until “Energy and evolution” (Van Valen 1976) burned out most of my higher cognitive centers. I say “recovering” evolutionary theory junkie because after grad school I mostly went clean. The problem is that dinosaurs are good for a lot of things, but exploring the inner workings of evolution is usually not one of those things. As products of evolution, and demonstrations of what is biomechanically possible, dinosaurs are awesome, and we can look at macroevolutionary patterns in, say, body size evolution or morphospace occupation, but we almost never find dinos in sufficient numbers to be able to test hypotheses about the tempo and mode of their evolution on the fine scale. I suppose I could have switched systems and worked on critters in which the machinations of selection are more visible, but for me even the charms of evolutionary theory pale next to the virulent allure of sauropods and pneumaticity. Three growth stages of Tyrannosaurus on display at the Natural History Museum of Los Angeles County. Hone et al. (2016: fig. 1). Actually, we can be pretty sure that the weird ontogenies and weird ecologies of dinosaurs were intimately linked (see, for example, Varricchio 2010). 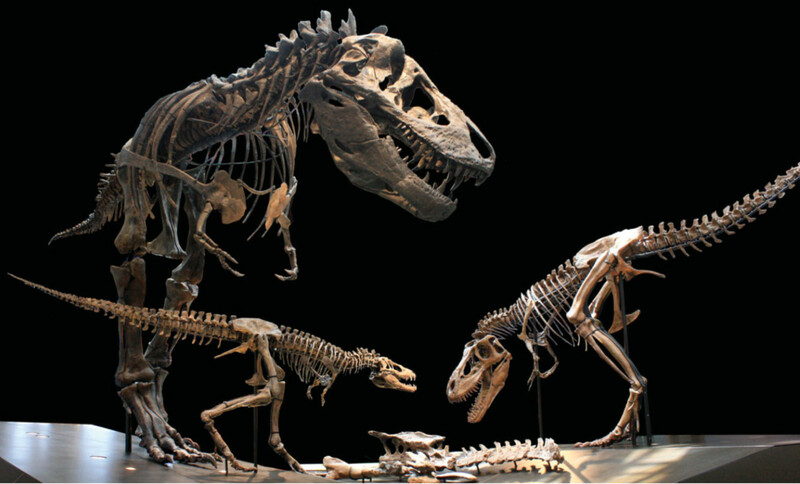 Like the tyrannosaurs shown here – they didn’t all fill the same ecological niche. This casts some old arguments in a new light. Was T. rex adapted for fast running? Prrrrobably – just not as a full-size adult. The skeleton of an adult tyrannosaur is that of a 500 kg cursor pressed into service hauling around 10 tons of murder. And all of this has some pretty exciting implications for thinking about dinosaurian ecosystems. Whereas mammals tend to fill up ecospace with species, dinosaurs filled up their world with ecologically distinct growth stages. Correct identification of life stage also is relevant to fundamentals of evolution—if the onset of sexual reproduction substantially preceded cessation of growth in dinosaurs then the ‘adult’ phenotype may not have been the primary target of selection. In fact, once juveniles or subadults are capable of reproducing, it is conceivable a population could exist with potentially no individuals making it through the survivorship gauntlet into ‘adulthood’ and close to maximum body size. The occasional hints from the fossil record of anomalously large sauropods like Bruhathkayosaurus , and the Broome trackmaker  might be explained if many sauropods were primarily ‘subadult’ reproducers, and thus extremely large adults were actually vanishingly rare. Did that actually happen? Beats me. But it’s consistent with what we know about sauropod life history, and with the observed scarcity of skeletally mature sauropods. And it might explain some other oddities as well, such as the high diversity of sauropods in seasonally arid environments like the Morrison Formation (see Engelmann et al. 2004), and the fact that sauropods – and large dinosaurs generally – are much larger than predicted based on the land areas available to them (see Burness et al. 2001). Because the age structure of sauropod populations was so skewed toward juveniles, the average body size of most sauropod populations was probably fairly modest, even though the maximum size was immense. So maybe a continuously reproducing population didn’t require as much food or space as we’ve previously assumed. If we can falsify that, cool, we’ll have learned something. And if we can falsify the alternatives, that will be even cooler. I’ll stop waving my arms now, lest I achieve powered flight and really inspire controversy. Many thanks to Dave and Andy for bringing me on board for this. It was a fun project, and we hope the paper is useful. You can read Dave’s thoughts on all of this here. Burness, G.P., Diamond, J. and Flannery, T., 2001. Dinosaurs, dragons, and dwarfs: the evolution of maximal body size. Proceedings of the National Academy of Sciences, 98(25), pp.14518-14523. Engelmann, G.F., Chure, D.J. and Fiorillo, A.R., 2004. The implications of a dry climate for the paleoecology of the fauna of the Upper Jurassic Morrison Formation. Sedimentary Geology, 167(3), pp.297-308. Klein, N. and Sander, M., 2008. Ontogenetic stages in the long bone histology of sauropod dinosaurs. Paleobiology, 34(2), pp.247-263. Van Valen, L., 1976. Energy and evolution. Evolutionary Theory, 1(7), pp.179-229. Varricchio, D.J., 2011. A distinct dinosaur life history? Historical Biology,23(1), pp.91-107.